Please scroll down this page to see samples of our work. Click to enlarge. 1920s Clarke Jewel This beauty was a rust bucket in a barn for 70 years. Quite a Restoration Job! 1940s in the ever popular Cobalt Blue 16″ W Oven Broiler below storage on left side chrome-top and toe-plate Sassy! S”Rare Red” can no longer be done in Red 38″ W Griddle on the left w Broiler underneath “Soupwell” Right Rear Storage Pantry on the right Classic 1950s! “Custom Copper” with Chrome top and Back Splash Teflon Griddle on the left with Broiler underneath “Soupwell” on the right rear this one glows! 1949 “Made in America” post-war pride! 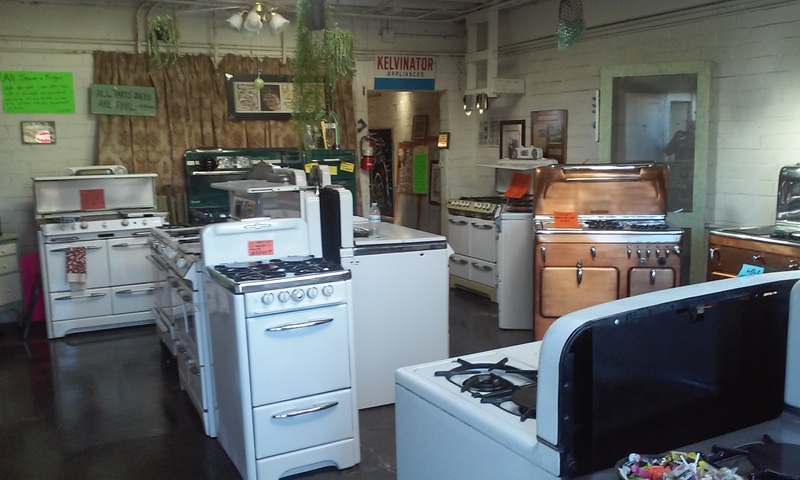 39″W 2 Ovens one with window and Light 2 Broilers below 6 Burners Clock S&P Shakers (not shown) Fold down (or up) Bakers Shelf “torpedo light A Cooks “Cooker”! 1953 2 ovens 2 broilers griddle in the middle windows with lights fluorescent Lamp with diffuser aux plug’s 38.5 W x 28 D Nice Lines! “Rare Red” fitting right in! Note: Most stoves shown on this page are spoken for. However we can replicate most that you see. Call for availability. Most restorations take between 8 – 12 weeks; 10 being the average. Another stove of interest we Sold and Restored for a customer was “The Reagan Stove” previously owned by President Ronald Reagan and his wife Nancy Reagan, the epitome of mid-century estate stoves. Click here to view page.